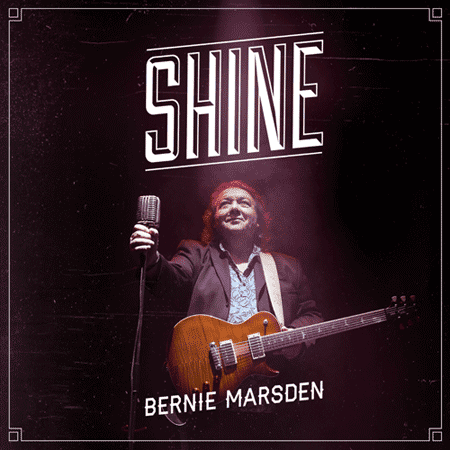 I just received the newest release, Shine from Bernie Marsden and it is solid. Opening with Linin' Track, a classic work song, Marsden opens as a solo vocalist but is quickly joined by an explosion of blues rockin' including Mark Feltham on harp and particularly strong drums. Nice! Next up is Wedding Day and Marsden and some drone note finger picking on electric guitar. Very cool ! With a catchy melody and contemporary feel Marsden rips out a nice guitar solo icing the track. Walk Away has a real pop feel and bright keyboard work. Marsden lays down some of his solid guitar riffs making this arena rock track complete. Kinda Wish She Would is a ragged rocker with a lot of bite. With it's great drive, piano support and biting guitar riffs, it's likely my favorite track on the release. Ladyfriend has a distinctly British rhythm (think When The Levee Breaks) and a crying harp. What's not to like. Next up is Trouble featuring David Coverdale on lead vocal. This is a hot blues rocker with super drum work and well placed organ dialogue accentuating the Marsden's guitar work. Who Do We Think We Are? is another track with a strong radio theme. Marsden plays a particularly melodic guitar solo on this track with nice backing vocals from Rob Cass and Pearse Macintyre. Cherry Lee Mewis takes the lead vocal on Bad Blood. This track has a great driving bass and drum line setting a solid blues base. Marsden steps up nd lets his guitar do the talking with well placed searing guitar phrases. Very nice! Joe Bonamassa is featured on lead guitar on Shine, an open wheeled racer with vocal harmonies. Rumble rhythm drum and bass work adds a nice accent to this solid rocker. Dragonfly is a haunting track with Fleetwood Mac (Peter Green's) like glistening guitar chords. A cool guitar melody makes this another of my release favorites. Tandem guitar leads, smooth vocals and a straight forward rock beat make this track a rocket to the radio. Hoxie Rollin' Time has a real cool blues rollin' beat with a nice lope and Marsden rides the wave. Clever drum riffs and tight organ work make this another of my picks for this release. Wrapping the release is NW8, an acoustic resonator track with a nice melody supported by keys and light percussion. A very nice track to close an interesting release from Marsden.